Two years ago, when I was pregnant with my daughter, the ONLY sign of me nesting was that I started to get interested in cookery again. I used to while away time daydreaming of what I was going to cook each time we had visitors. The daydreams were elaborate, the visitors infrequent. Come November that year, I got it into my head to make my mince pies totally from scratch. So I made Delia's mincemeat and bought pastry from the shop as I've never got the hang of making my own - it always falls apart. But the result was disappointing. The pastry shrank, the contents spilled out and on the whole, I am just not a fan of mince pies made in tiny tart tins. Another reason why I'm fat is because I love deep filled mince pies. What's the point of having a pie if there's more pastry than filling? Never understood that. So I passed a jar of mincemeat over to my mother who then made her own mincemeat as well and in a blind taste test amongst my family, my mincemeat won. Huzzah! But I still had to figure out how to achieve the perfect - or a better - pie. Last year had similar results. 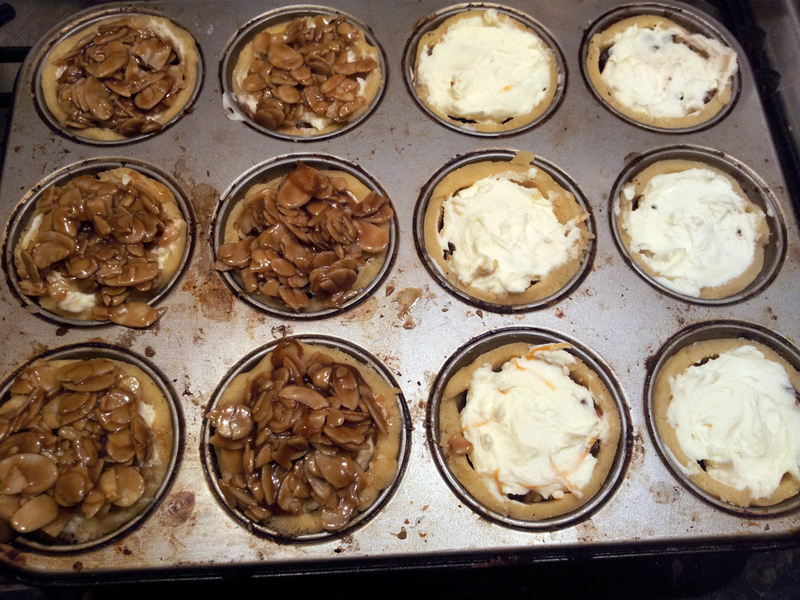 I think I maybe need a bigger pastry cutter as I ended up with mincemeat topped pastry discs. This year, I'm determined it will be different. So after lots of research and a minor disaster road-testing shortcrust pastry at my mothers the other day (I misread the flour quantity! ), I finally decided that today was M-day. As I was idly scrolling through Twitter and trying to find a good recipe for pastry, I happened across a tweet from the lovely @ThomasinaMiers (I'm not obsessed or a stalker - honest!) claiming that she had a recipe for 'The Best Mince Pies'. And they're deep-filled. Sold! But alas, her pastry recipe called for lard and I didn't have any. Further reading on the lard issue showed that whilst lots of chefs recommend it because according to Auntie Delia 'it has the best flavour', all butter would be fine too. Discounting lots of recipes for pastry that use all butter, I once again turned to the lovely Dan Lepard (seriously, I just admire him and his lovely new book!) for his take on sweet shortcrust. Bingo. Simplicity in itself again. I made the almond version. If you want to watch him and find out the recipe I used, there's a video on YouTube. Or buy the book! The pastry came together perfectly. It rolled like a dream. My two-year-old mincemeat was beautifully mature (Delia says it keeps for three years in a cool, dry place). The toppings for the mince pies tasted scrummy. They went into the oven and disaster struck. 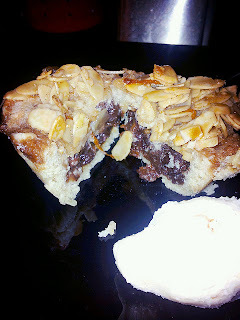 The sticky almond topping has melted everywhere. I haven't a hope in hell of getting the mince pies out of the tin in one piece (I nipped off to take them out of the oven mid blog to discover this). There is boiled sugar all across the bottom of my oven (I stupidly didn't put a tray underneath the mince pie shelf. To say I am gutted is an understatement. I could cry - but they're only mince pies. What a complete waste of my last jar of mincemeat and all the other lovely ingredients. So I'm still crap at making mince pies and will not be baking again for the foreseeable future. Thanks for the pastry Dan and Delia for the mincemeat which was lovely last time I tried it. I just wish I knew what I'd done wrong. Did I overfill them? Maybe. There was an awful lot of topping to go round to the point that I still have some left over in the fridge. Shame there's no picture with the recipe to show you what the completed mince pies look like. I have a before pic (excuse the state of my tin - the photo makes it look worse) and will add an after pic if I can prise one out. If you ever read this Thomasina, please do give me some advice. Update 07 Dec 2011: Having left the pies to cool overnight, I've managed to liberate most of them aside from two that crumbled. They tasted a-mazing!!! Will definitely make again although would possibly try a different pastry recipe as it was very soft and melted in the mouth but struggled to contain the weight of the contents - perhaps the actual recipe with lard based pastry would've been better?? And also use less topping and perhaps a 10cm guide for cutting to give a bit more space to contain the topping.